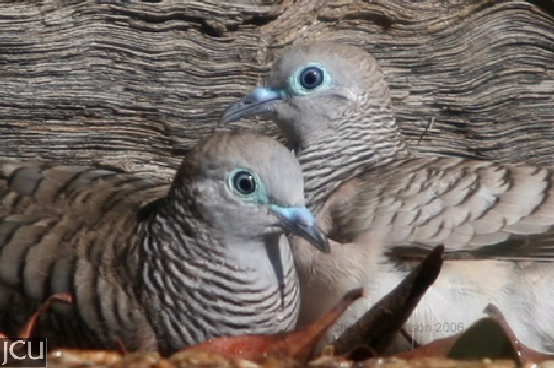 This species forages for seeds in grassy areas and is common on campus, usually in pairs or many, mostly softly cooing. Upperparts grey to pale brown with black bars, underparts greyish white with bars across the area of the crop, delicate pinkish tinge on lower parts. Legs and feet yellowish with pink tones, eyes cream with naked pale blue skin surrounding, bill bluish.